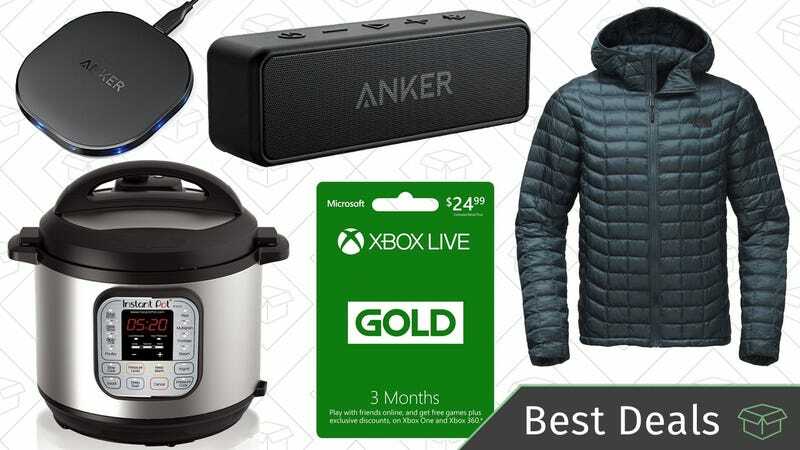 The first Instant Pot discount of the year, one of your favorite Bluetooth speakers, and a ton of Presidents Day sales are just the start of Monday’s best deals from around the web. Unlike the uber-popular Audio Technica ATH-M50x, the M20x headphones aren’t collapsible, their cable isn’t detachable, and they won’t sound quite as good, but they’re still a tremendous value at $39 if you still use wired headphones. That’s $10 less than normal. This fitted mattress pad claims to relieve pressure points that can arise with firm or uneven mattresses, and it’s stuffed with “hypo-allergenic cluster down fiber,” which should sleep much cooler than the traditional memory foam. Prices range from just $64-$83 today, depending on the size, but just note that this is a Gold Box deal, meaning this price is only available today, or until sold out. Amazon makes toilet paper just for Prime members, and you can get 24 rolls for just $14 when you use Subscribe & Save and clip the $5 coupon on the page. You can always cancel your subscription after the first order ships. Yes, it’s already happening again. Nordstrom Rack has brought back their Clear the Rack sale and it’s full (and I mean FULL) of really incredible deals. Designer clothing, brands you’ve never heard of, everything in clearance an extra 20% off. Having the proper footwear is the difference between spending the day working and spending the day in the Emergency Room. If you’ve been living dangerously lately, why not invest in a pair of work boots that won’t have you fighting for workers’ comp? Amazon is marking down work and safety boots to under $100, but it’s today only, so you should probably get to work. For one day only, Amazon’s shaving the price of one of our readers’ favorite electric razors, the Panasonic Arc4. This particular one even includes a pop-up precision trimmer for sideburns and the hairs just under your nose. $80 is within $3 of the best price Amazon’s ever listed, but it’s a Gold Box deal, so it won’t be around long. Joe’s New Balance is the premiere online outlet for...New Balance shoes, obviously. Right now, they’re giving you deal you won’t want to miss. Not only is there 40% off basically everything on their site, they also have free shipping, today only. Plus, their deal of the day is the New Balance 220 for just $33. Right now, GAP has a huge sale where everything is discounted up to 50%, which is great, sure. But they have two another deal you’re going to want to check out. Their two codes live right now, PRESDAY for 20% off everything, and 30% off sale styles with the code EVENBETTER, stack at checkout so you can get even more discounts on sale items. Once again, LOFT is here to save your wardrobe. 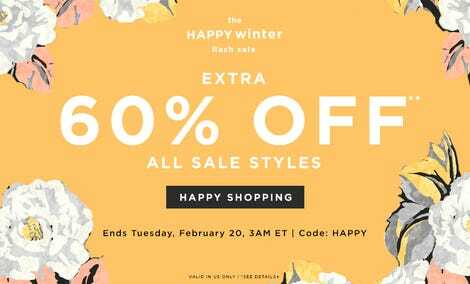 Get 60% off literally everything that’s on sale already when you use the code HAPPY. Their sale section has a ton of really awesome outwear, sweaters, pants, and more. I’m eyeing this pink skirt, and if you’re looking for an good transitional piece, how about this velvet blazer? The Fitbit Charge 2 is one of the best fitness trackers you can buy, and it’s down to $120 right now on Amazon, about $30 less than usual. That’s not quite as enticing as its $99 Black Friday discount, but by any other measure, it’s a deal worth running for. Prefer something nearly as smart in a more fashionable package? The Alta HR is down to the same price. And if you’re looking for a full smart watch experience, both the Blaze and Ionic are also on sale. Uniqlo not only has a bunch of new styles (including the perfect spring rain jacket in new colors), they’re giving you free shipping on your entire order, today only. Pick up HEATTECH for the whole family, or new outerwear for your upcoming travels. This 3D Westeros puzzle is basically the Game of Thrones opening credits map, but in real life. It’s a jigsaw puzzle, overlaid with a 3D topography map, topped with 3D models of the continent’s greatest cities. Based on characters’ travel speeds in the show’s most recent season, I think it’s also at 1:1 scale. If you own a Nintendo Switch, buying a copy of Super Mario Odyssey is basically a requirement. If you don’t have yours yet, Amazon’s offering a rare discount down to $49 today on both the physical and digital version, one of the best prices we’ve ever seen.